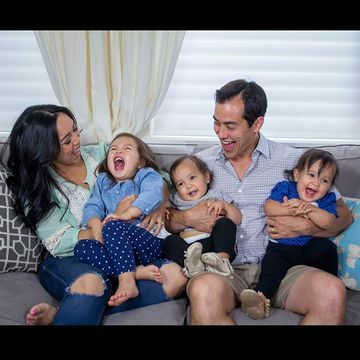 YouTube sensation and stay-at-home mom Judy Travis, of video blogs itsjudytime and itsMommysLife, speaks to Fit Pregnancy about keeping her and her family in shape. Judy Travis, a stay-at-home mom and YouTube star behind itsjudytime and itsMommysLife, isn't just about watching her kiddos via the baby monitor as they pretend to be asleep and demonstrating the latest beauty looks, she's also a woman who makes an effort to workout. And nope, not at the gym on her own or with multiple weights and classes—Travis uses her children as inspiration to break a sweat. We can't help but love this video below, which reminds us so much of our own at-home workouts: try to hold a plank, baby crawls toward you. Start to do an ab routine? Baby is sitting on you. Want to do a set of mountain climbers and work up your cardio? Baby needs your attention. Judy—you've stolen our hearts and broken into our minds. "Staying healthy is definitely a priority, however it's even more important to make sure my family does as well. Part of good health is exercise and even though it's not my favorite part of the day, I still make sure to find time to fit it in," she says. We give her props for her dedication, especially when finding time to shower is enough of an effort for most of us, some days (riiiiiiiight???). But what we love the most is her healthy, positive attitude towards staying in shape and how it shows generations the importance of taking care of their bodies. "Having my kids not only see me work out but also be involved is my way to help them understand the importance of exercise in a healthy lifestyle," she says. Take some cues from this sweet video (and an exclusive Fit Pregnancy intro) and try your own at-home family workout. What better way to show your babes how much they mean to you?